Lessons for Micro Beginners Modern Machine Shop 69 or 0.015 inch and smaller, "because that's really where everything changes." Taking the time to learn how to eectively make chips at this scale is also precisely where Mr. Bak- lund says "a lot of companies are missing the boat." With that in mind, the lessons he has learned over the last few years are worth sharing. "Can't Be Done" "We're just a small shop next to a cornfield out in Hutchinson, Minnesota," Mr. Baklund says. 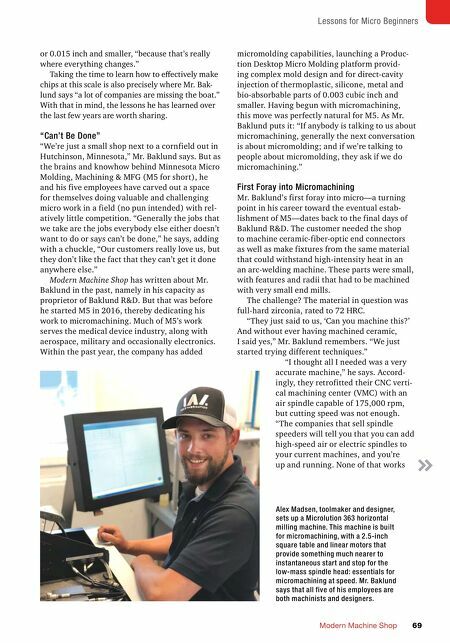 But as the brains and knowhow behind Minnesota Micro Molding, Machining & MFG (M5 for short), he and his five employees have carved out a space for themselves doing valuable and challenging micro work in a field (no pun intended) with rel- atively little competition. "Generally the jobs that we take are the jobs everybody else either doesn't want to do or says can't be done," he says, adding with a chuckle, "Our customers really love us, but they don't like the fact that they can't get it done anywhere else." Modern Machine Shop has written about Mr. Baklund in the past, namely in his capacity as proprietor of Baklund R&D. But that was before he started M5 in 2016, thereby dedicating his work to micromachining. Much of M5's work serves the medical device industry, along with aerospace, military and occasionally electronics. Within the past year, the company has added micromolding capabilities, launching a Produc- tion Desktop Micro Molding platform provid- ing complex mold design and for direct-cavity injection of thermoplastic, silicone, metal and bio-absorbable parts of 0.003 cubic inch and smaller. Having begun with micromachining, this move was perfectly natural for M5. 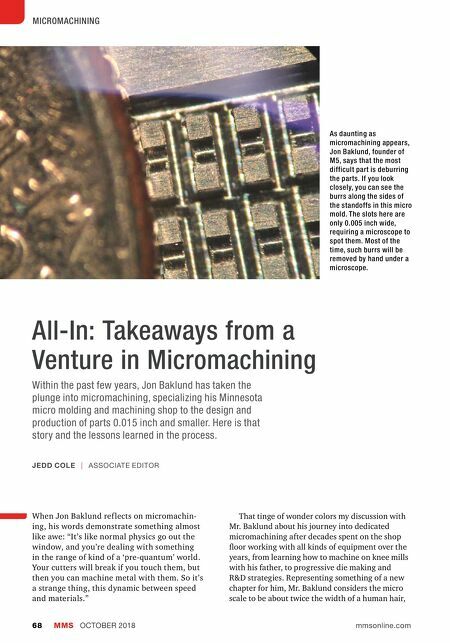 As Mr. Baklund puts it: "If anybody is talking to us about micromachining, generally the next conversation is about micromolding; and if we're talking to people about micromolding, they ask if we do micromachining." First Foray into Micromachining Mr. Baklund's first foray into micro—a turning point in his career toward the eventual estab- lishment of M5—dates back to the final days of Baklund R&D. The customer needed the shop to machine ceramic-fiber-optic end connectors as well as make fixtures from the same material that could withstand high-intensity heat in an an arc-welding machine. These parts were small, with features and radii that had to be machined with very small end mills. The challenge? The material in question was full-hard zirconia, rated to 72 HRC. "They just said to us, 'Can you machine this?' And without ever having machined ceramic, I said yes," Mr. Baklund remembers. "We just started trying different techniques." "I thought all I needed was a very accurate machine," he says. Accord- ingly, they retrofitted their CNC verti- cal machining center (VMC) with an air spindle capable of 175,000 rpm, but cutting speed was not enough. "The companies that sell spindle speeders will tell you that you can add high-speed air or electric spindles to your current machines, and you're up and running. None of that works Alex Madsen, toolmaker and designer, sets up a Microlution 363 horizontal milling machine. This machine is built for micromachining, with a 2.5-inch square table and linear motors that provide something much nearer to instantaneous start and stop for the low-mass spindle head: essentials for micromachining at speed. Mr. Baklund says that all five of his employees are both machinists and designers.